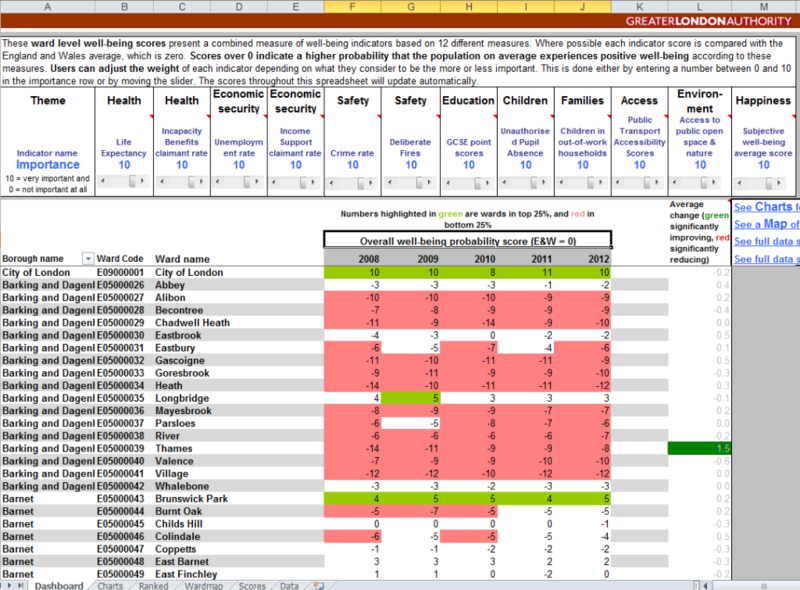 This dataset contains Barnet's raw data for ward level well being indicators as well as related scores. 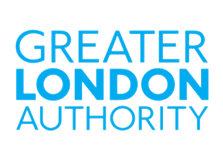 We have also linked to the Greater London Authority data for London as a whole as well as an interactive tool you can use to interrogate the data. These ward level well being scores present a combined measure of well-being indicators of the resident population based on 12 different indicators. Where possible each indicator score is compared with the England and Wales average, which is zero. Scores over 0 indicate a higher probability that the population on average will experience better well-being according to these measures. Users can adjust the weight of each indicator depending on what they consider to be the more or less important, thus generating bespoke scores. This is done either by entering a number between 0 and 10. The scores throughout the spreadsheet will update automatically. The tool combines data across a range of themes for the last five years of available data (2009-2013). The well-being scores are then presented in a ranked bar chart for each borough, and a ward map of London. The spreadsheet also highlights wards in the top and bottom 25 per cent in London. Wards that have shown significant improvement or reduction in their scores relative to the average over the five year period are also highlighted. Borough figures are provided to assist with comparisons. Rankings and summary tables are included. The source data that the tool is based on is included in the spreadsheet. IMPORTANT NOTE, users must enable macros when prompted upon opening the Excel spreadsheet (or reset security to medium/low) for the map to function. The rest of the tool will function without macros. If you experience any difficulties with downloading this spreadsheet, please contact the London Datastore in the Intelligence Unit. Detailed information about definitions and sources is contained within the spreadsheet. With some measures if the data shows a high figure that indicates better well-being, and with other measures a low figure indicates better well-being. Therefore scores for Life Expectancy, GCSE scores, PTALs, and Access to Public Open Space/Nature have been reversed so that in all measures low scores indicate probable lower well-being. The data has been turned into scores where each indicator in each year has a standard deviation of 10. This means that each indicator will have an equal effect on the final score when the weightings are set to equal. Why measure well-being for local areas? It is important for London policy makers to consider well-being at a local level (smaller than borough level) because of the often huge differences within boroughs. Local authorities rely on small area data in order to target resources, and with local authorities currently gaining more responsibilities from government, this is of increasing importance. But small area data is also of interest to academics, independent analysts and members of the public with an interest in the subject of well-being. How can well-being be measured within small areas? The Office for National Statistics have been developing new measures of national well-being, and as part of this, at a national and regional level, the ONS has published some subjective data to measure happiness. ONS have not measured well-being for small areas, so this tool has been designed to fill this gap. However, DCLG have published a tool that models life satisfaction data for LSOAs based on a combination of national level happiness data, and 'ACORN' data. Happiness data is not available for small areas because there are no surveys large enough for this level of detail, and so at this geography the focus is on objective indicators. Data availability for small areas is far more limited than for districts, and this means the indicators that the scores are based on are not all perfect measures of well-being, though they are the best available. However, by using a relatively high number of measures across a number of years, this increases the reliability of the well-being scores. How can this tool be used to help policy makers? Each neighbourhood will have its own priorities, but the data in this tool could help provide a solid evidence base for informed local policy-making, and the distribution of regeneration funds. In addition, it could assist users to identify the causes behind an improvement in well-being in certain wards, where examples of good practice could be applied elsewhere. This tool was created by the GLA Intelligence Unit. Please contact datastore@london.gov.uk for more information. Barnet-specific, ward level raw data on well-being. Barnet-specific, ward level raw data scores for well-being.